We are once again bringing you our occasional Friday feature Recommended Reads, where we share some of the wonderful books for children and young adults. 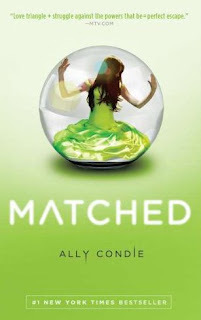 This week's book is Matched, by Ally Condie, originally published by Dutton Publishers in 2010. Movie Adaptation: Disney bought the rights to the Matched trilogy in 2010; however, no release date has been publicized. On her seventeenth birthday, Cassia Reyes goes with her parents to City Hall to find out whom she will marry. She’s excited and nervous about this event that every adult in the Society, Cassia’s world, has gone through it before her. Instead of being matched to a boy in a far-off city as she expected, however, Cassia is surprised and thrilled to learn that she’s been matched to her best friend Xander. It seems that, as always, the Society has made the right choice for her. After this seemingly harmonious beginning, Matched quickly morphs into a dystopian novel. When she loads the disc she has been given to learn more information about Xander, she sees Ky’s face flash before her instead before it is replaced by Xander’s. In a world in which there are no errors, how could this have happened? Was Ky, the shy, mysterious boy she barely knows, really intended to be her match? This is the first small crack in the foundation of Cassia’s trust of the Society, which controls its citizens’ meals, reading materials, leisure activities, romantic lives, communication, and even deaths. A forbidden poem smuggled to her by her grandfather, increased scrutiny of the routines she used to take for granted, and her growing relationship with Ky all lead Cassia to slowly learn about the darker side of the Society. Everyone around her is healthy and prosperous, but Cassia learns that this comes at a cost she’s not sure she’s willing to pay anymore. Be warned: Do not give this book to a teenage girl in your life during finals week; she won’t be able to put it down once it gets going. Like other dystopian novels before it—the incomparable The Giver, Brave New World, etc.—Matched presents a world that’s both attractive and horrifying, causing readers to reflect on the true nature of happiness and the importance of freedom. Matched is a very internal book, focusing intently on Cassia’s thoughts so that her transformation from a blindly accepting member of the herd to a brave dissident is striking. We particularly enjoyed the detail with which Condie developed the Society, and she proves to have a keen eye for developing suspense as well. As literature lovers, one our favorite aspects of the book was the frequent and apt allusion to Dylan Thomas’s “Do Not Go Gentle Into That Good Night.” The novel served as a wonderful vehicle for exploring both the meaning of Dylan’s poem and of the power of poetry in general. The only thing readers are unlikely to enjoy about Matched is its cliffhanger ending, but rest assured that it’s the first in a trilogy and resolution is only as far as the nearest library. Reading Club – No Girls Allowed!